Welcome to Your Maths Tutor! Are you seeking support for National 4/5, IGCSE, GCSE, Higher, Advanced Higher, AS or A Level in maths, physics or chemistry? If so then you’ve come to the right place! 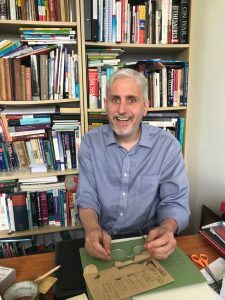 Welcome to the website of Ian Wild BSc(hons) CPhys MInstP MBCS, an experienced teacher and tutor operating out of his base in central Edinburgh. Ian tutors students of any age in National 4, 5, Higher, Advanced Higher, GCSE, IGCSE, AS/A Level and IB at their homes or at a location to suit. Using a bespoke virtual classroom, Ian also offers online tuition to mathematics and physics students worldwide. Please click on Contact from the main menu for further details, or About to learn more about Ian and his work. Many thanks for visiting the Your Maths Tutor website! I strongly believe that one-to-one tuition can not only bring exam success but also, if it’s done with passion and enthusiasm, instil in students a lifelong drive to learn. Please check out just some of the client feedback I’ve received on the Testimonials page. Students often come to me through personal recommendation. I am passionate about helping our students build confidence and grow their abilities in maths, physics and chemistry. My teaching is always tailored to each individual learner. Please click here to learn more about my tutoring approach. Click on About from the main menu to find out more about me and my work. New for 2018 – The Your Maths Tutor Virtual Classroom! Are you struggling to find time for face-to-face tutoring during busy weekday evenings? Perhaps you are looking to join a friendly group to help you to brush up on your maths and science skills? If so then the Your Maths Tutor Virtual Classroom is for you. Using the same advanced, open source online virtual classroom technology employed by some of the world’s leading educational institutions, the Your Maths Tutor virtual classroom provides live audio and video conferencing, multi-user whiteboard, breakout rooms, session recording and much more. We will be posting to the blog and to YouTube often so please keep calling back. The Maths and Science Message boards – Low cost maths and Physics help! Needing maths and physics help but don’t want to pay for in-person or online tuition? 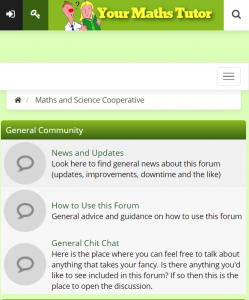 Subscribe now to our maths and science message boards. A 7 day subscription costs just £7 – a great value £1 per day! Click here to learn more or visit us at the Your Maths Tutor Maths and Science Cooperative now! 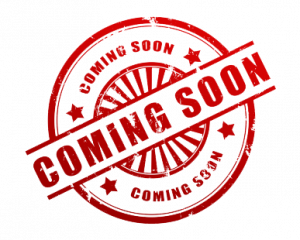 The Your Maths Tutor Learning Hub is being created primarily to help students studying for Scotland’s National 4 and 5, Higher, and Advanced Higher mathematics and physics exams – but we will be providing comprehensive GCSE, IGCSE, AS, A2 and IB help and support too! The Hub will contain articles and resources that help explain key topics, exam-style questions to practice on, and forums where we can all get together to discuss problems and explore solutions.